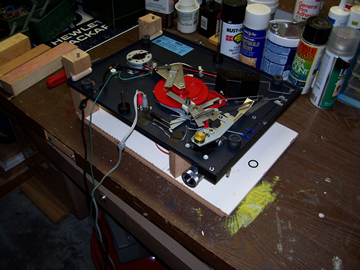 Summary: The platter on an old BIC 900 series audio turntable can lock up when the original grease dries out. 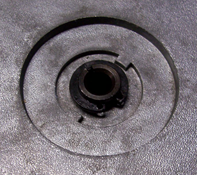 Forcibly rotating the platter damages the spindle by enlarging the hole in the spindle mounting base. This can be repaired by using a center punch to make the hole smaller again. Over 30 years after I purchased my BIC 960 turntable, the platter froze up and would not turn. I read in some audio forum comments that penetrating oil could free up the platter. I applied the oil, waited a few hours, and then turned the platter by hand thinking to loosen it. When I did this, I was initially thrilled because I thought I was making progress at freeing the grease. I did not know then how the platter and spindle were constructed. At first the rotation was difficult and it stuck more at some positions than at others. But as I applied more penetrating oil and turned it more, the platter became looser. It was only much later that I realized that the spindle was turning in the hole of the support base. To fully disassemble the turntable, you need a work stand that can support the turntable upside down while you work. I made one from scrap wood in my shop. The left hand supports are made from 2x2s, 6 inches long. I cut a notch into each one that is 3/4 inch deep and 3/4 inch high. The bottom edge of the notch is 4 inches high. I then drilled a hole through the top of the support, 3/8 inch from the notch edge, all the way down into the notch. The purpose is to push down on a small block of wood, acting as a clamp to hold the turntable base in place inside the notches. The base is a piece of plywood, 11 inches by 17 inches. The two notched supports are positioned on the left side of the base. Their centers are 9 inches apart. 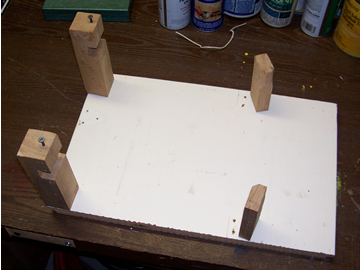 The supports on the right are pieces of 1×2 wood, 4 inches long. They are angled on the base to fit between the platter and the tone arm assembly. Both are shaved down slightly on top to fit between parts. I determined the locations by measurement plus trial and error. If you haven’t already done so, free the platter from the spindle by applying penetrating oil and letting it soak all the way down the sleeve. This can take several days. You can remove the circlip at the top of the spindle at any point while you wait for the penetrating oil to work. Use circlip pliers, screwdrivers, or a pair of wooden sticks. You need to have the platter off before you flip the turntable upside down and place it on the work stand. With the platter removed, prepare to remove the metal turntable platform from the wooden and plastic base. Lock the tone arm to the rest. Remove both shipping wing nuts from the underside of the base. Now lift the platform up from the base. Work the wires through the clear plastic bottom cover until you can prop the platform on edge and completely remove the wires from the base. Flip the platform upside down and insert the left edge into the notches in the work stand supports. The left edge is opposite the tone arm. The platform should then rest on the right hand supports without touching any part of the tone arm assembly. To keep the platform from moving as you work, insert small blocks of wood (about 1/2 inch thick) into the left support notches. Then tighten the screws in the top of the supports so the wood is pressed down against the metal platform. The spindle base is a 3-4 mm thick piece of galvanized sheet steel with a roughly triangular shape. Unfasten the wire bundle from the base and remove the nut on the red plastic gear shaft. Remove the two screws that hold the spindle base to the platform. All screws and the nut are marked in the photo by red arrows. Note that one of the base attachments screws also holds the green ground wire. With all the screws removed, place one hand under the platform, below the spindle. Lift the spindle base and remove it carefully from the platform. If the bearing parts are loose, they will fall into your hand. Clean the spindle and bearing parts thoroughly. I used paint thinner followed by a rinse with denatured alcohol to remove the oily film. 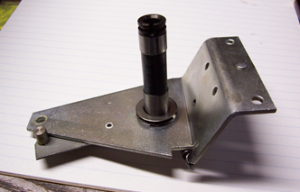 Remove the bearing parts and set them aside while you repair the spindle mount. Also remove the spring on the spindle base and the cam follower arm. 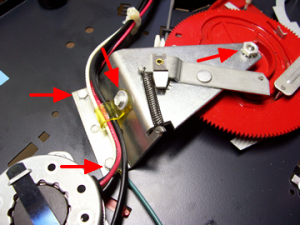 You will need to push the cam follower arm out of the way to expose the spindle mounting hole. Repair and reassembly are covered by Page 2 of this article. I’ve been soaking turntable with wd40 for 2 weeks in the right location (not down the spindle hole) and won’t budge. 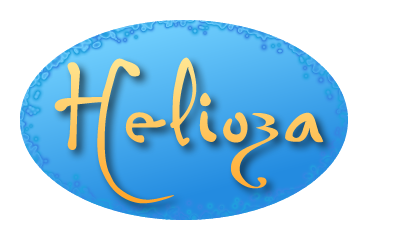 Really want to get this workin …. Heat is a definite way to loosen grease. Use a heat gun right in the center of the platter, even a hair dryer gun might work. Heat for a while then try to rotate the platter paying attention to the shaft it’s on doesn’t move. You may need to go up in heat but I doubt it. Patience is the key.